Father of synthetic biology: Tom Knight on BioBricks, iGEM, and the craziest synthetic biology. What’s More Dangerous: Biology or Synthetic Biology? The latest applications made by engineering living things. 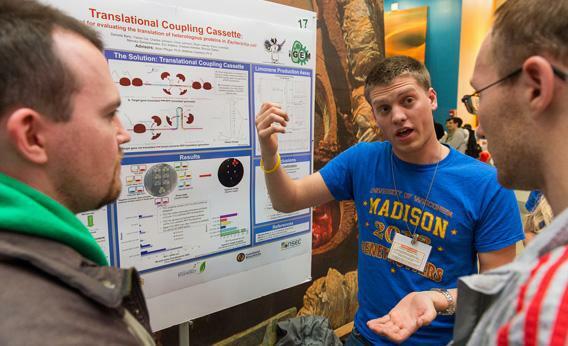 Student teams present their work at the iGEM 2012 World Championship Jamboree in November in Cambridge, Mass. Photo by Justin Knight/the iGEM Foundation. Tom Knight got the bug for bioscience while he was a computer engineer at MIT. He founded the synthetic biology field and help set up bioengineering company Ginkgo BioWorks. He says we’ll soon be able to engineer living things with mechanical precision. Andy Coghlan: How is synthetic biology different from biotechnology? Tom Knight: The main difference is the degree of control. Engineers want their inventions to be as predictable and free from complexity as possible. That’s what makes the approach of equipping living things with standardized DNA modules called BioBricks—of which some 15,000 are now available in an open-source registry—different from the prevailing biotechnological practice of inserting single genes randomly into living things. The key realization is that biology is a manufacturing capability. We can have it build the things we want. AC: How do you feel when people call you the “father of synthetic biology”? TK: It’s everyone’s dream to see ideas that have become popular inspire research projects and students. I’ve been lucky to see both things happen through the International Genetically Engineered Machines (iGEM) competition for students, which I helped inaugurate in 2004. AC: The 2012 winners have just been announced. What entry among the hundreds submitted over the years has inspired you most? TK: A bacterium-based test that makes water samples change color if arsenic is present at potentially dangerous levels. This combines an application that is socially valuable and responsible with impressive biology, some attention to economics, and an ability to carry a project to a place, such as Bangladesh, where it works and is needed. AC: And what has the craziest entry been? TK: A project by artist Alexandra Daisy Ginsberg, in which she engineered E. coli to produce colored pigments. The idea was to develop a daily probiotic drink that would show, by changing the color of your poo, if you have an infection. AC: Can we control the potential risks created by engineering living things in this way? TK: Yes, I think so. Nature has the capacity to produce things far more dangerous than we can for now. AC: Where will synthetic biology be in 10 years? TK: It’s very hard to tell. We tend to overestimate what will happen in five years and underestimate what happens in 10. I often make comparisons with the development of electronics from modular components, and I don’t think we have any more of an idea what will happen than those who invented transistors in 1947. There was no way they could predict they’d end up in things called cellphones. AC: Now you are immersed in biology, what’s your favourite microbe? TK: Mesoplasma florum, which was found on a lemon tree in Florida in 1984. It’s to do with poo again—its natural habitat is the insect gut. It’s almost the smallest free-living organism discovered, at the boundary of being alive, so as an organism to study to find out how organisms survive, it’s ideal. AC: In your early career you worked on the Internet’s forerunner, ARPANET. What a shift. TK: I feel privileged to have witnessed revolution not once, but twice!